Every Saturday the Stone Soup Café convenes at the All Souls Church (Unitarian Universalist) to bring the people of Greenfield Massachusetts a healthy meal as well as a healthy sense of community. Originally founded in 2010 as the Montague Farm Café by the Zen Peacemakers. In 2012 the café moved to Greenfield MA lead by Executive Director Ari Pliskin. Drawing on their experiences in bearing witness and the Grayston Foundation, along with collaboration from actor and anti-hunger activist Jeff Bridges, the Zen Peacemakers developed the Let All Eat Cafes as a new model for addressing food insecurity. Not to be confused with a soup kitchen, the café is a pay-what-you-can cafe, there is no charge but those who are able to are encouraged to donate what they can. For that price one gets a healthy meal, fortified with locally sourced produce, and a sense of community and well being in a family orientated atmosphere. One of the key points is blurring the line between those who serve and those being served, people in need can also be in service to others, volunteering in the kitchen or on the food line. In this way they break down the conventional hierarchy of the charitable and the needy, everyone is on equal footing when they attend the cafe. More than a meal, empowerment is a big part of the Cafe’s mission providing experience and skills that can be used to secure work for those that seek jobs in these trying times. They don’t want to just feed the stomachs of those they serve for a day, they want to feed the spirit of their customers (customer being the preferred nomenclature, thus breaking the stigma of being "needy") for a better life, and stronger community. They aspire to hire those they can, providing paying jobs. When you attend the café you can not tell who is volunteering, who is working or who is paying, it is just a community coming together to enjoy each other and a healthy meal, that they can all contribute to. This breaks the model of "the better off" taking pity on the less fortunate and still remaining separate from them at the same time, there is no sense of us and them, the "haves and have nots". This is one community coming together contributing in small ways to make a big difference. The legend of Stone Soup. 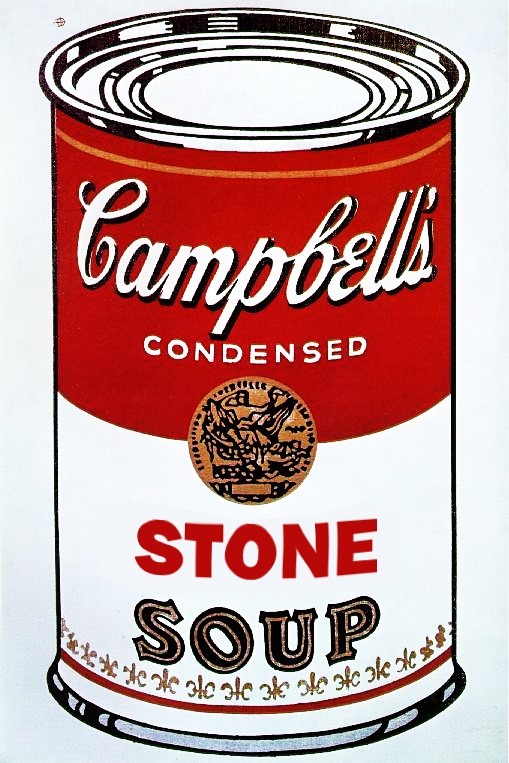 There are many versions of the Stone Soup story, but they all share a basic theme, that of many small contributions leading to an enriching and sustaining nourishment for the whole community. It goes something like this. Two vagabonds arrive in a village and along one of its well traveled paths they set up a stew pot, filling it with water from the local stream and placing a rock in the pot. As a villager passes by they inquire what the vagabonds are up to, "we’re making a delicious pot of Stone Soup, but it still needs a bit of seasoning, a little parsley would do the trick" so the villager goes off and returns a little later with a handful of parsley to toss in the pot. Meanwhile another villager also stops to see what the vagabonds are cooking, seeing only parsley and a stone they are told the soup just needs a bit of carrots to add to its flavor. So they also go and return tossing a handful of carrots into the mix. This continues on as villager after villager stops, sees the ingredients adding up and then bringing some small contribution back to also toss in the stew. Before long the pot is full of tasty and nourishing stew, and the whole community then sits down to enjoy their soup, the soup they all built together with small contributions. The group holds an opening circle an a closing circle where attendees can share their hopes and aspirations while engaging in open conversation. They often have live music performed by local artists, adding to the sense of community and making for a more enjoyable meal experience. This helps break the stigma felt by those who are in need of food to survive, leaving them with a sense of worth and dignity. This is a community meal, by the community for the community, not a charitable hand out, but an inspiring and connecting event for all. The Stone Soup Café hopes to extend their operation to include Sunday as well, and to refine their model to be used by other communities around the nation, and possibly around the world. The pay-what-you-can aspect makes some contribution to cover expenses, but they also require donations to expand and to continue to provide the healthiest meals and and experience they possibly can. With that, Jeff Bridges has pledged to match dollar for dollar, donations up to $10,000 per year for three years. Maybe donate what you can and let’s send the Dude out to find a cash machine for a worthy cause. to my brother WURST,I am sorry to hear of your homelessness,I live in Cincinnati and will pray that a good full time job comes your way.Stay strong and contiue to ABide.